At The Law Offices of Jay Doyle in Austin, Texas, our attorney practices personal injury law exclusively. Why? Because we know that when our clients sustain injuries, they must deal with not only their pain, but also with medical, financial and legal issues. We see it as our duty and privilege to relieve them of their financial and legal burdens so they can focus on recovering and getting their lives back. In addition, when a client's loved one dies in an accident, we compassionately advise and represent the grieving family in their wrongful death action. Our clients trust our law office's attorney to personally handle their cases. Starting with their initial free consultations, attorney Doyle takes the time to get to know them, listen to their stories, answer all their questions and advise them of their options. He then puts his extensive experience and skills to work, obtaining the best possible result. We are proud that we resolve 95 percent of our cases through negotiation rather than having to go to trial. When trial is the only option, however, attorney Doyle is a ferocious advocate on behalf of our clients. Our track record of high-dollar awards has earned attorney Doyle membership in both the Million Dollar Advocates Forum and the Multi-Million Dollar Advocates Forum. He also is AV Preeminent* peer-review rated through Martindale-Hubbell. 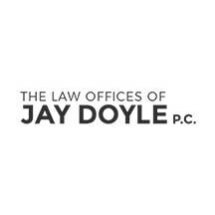 The Law Offices of Jay Doyle accepts credit cards. Hablamos español. *AV®, AV Preeminent®, Martindale-Hubbell Distinguished and Martindale-Hubbell Notable are certification marks used under license in accordance with the Martindale-Hubbell certification procedures, standards and policies. Martindale-Hubbell® is the facilitator of a peer review rating process. Ratings reflect the anonymous opinions of members of the bar and the judiciary. Martindale-Hubbell® Peer Review Rating fall into two categories: legal ability and general ethical standards.